← Three major steps forward and a bit more . . . 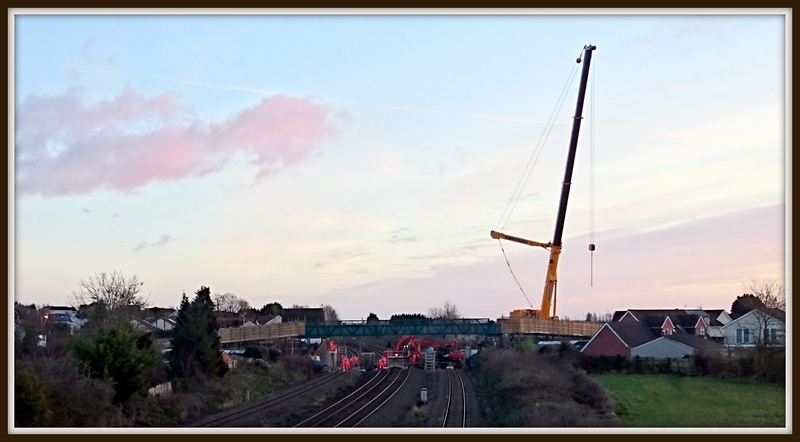 I was out early with the dog on Boxing Day morning and noticed that, while the trains were stopped for the holiday period and most people were still in bed, Network Rail staff and contractors were working hard on two more of the local rail bridges (Undy and Llandevenny). The London to South Wales mainline electrification programme has made massive progress in 2016 and so have we, the MAGOR group. Looking back, over the last 12 months we have completed and reviewed, with Network Rail, Mott MacDonald and Monmouthshire County Council (MCC), the GRIP Stage 1 and 2 reports. These reports showed that there were no obvious major problems with the possibility of building a new station to serve Magor and Undy. Additionally, we analysed data gathered by The Three Fields Trust, which indicated that there was a large pool of potential rail users in Magor and Undy which would make use of a new station and would also help to reduce road congestion and pollution along the M4 and B4245. We also received an independent ‘Integrated Transport’ report from a post graduate student of University West of England, which puts additional weight behind our case. In the summer, we gained further support from Assembly Members, Local MPs, Council leaders and officers. This led to the Wales Government Minister for Economy, and Infrastructure, Ken Skates, setting up a meeting between members of the MAGOR group and his rail officials. Following on from those discussions we have begun a series of meetings with representatives from each of the 4 companies that are bidding for the forthcoming re-letting of the Wales and Border rail franchise (which also includes key elements of the METRO project). So far, they have shown a real and welcomed keen interest in our plans! Finally, in November we jointly submitted, with MCC, an application to the UK government’s ‘New Station Fund’ to try to secure a major contribution to the build cost of the station (currently estimated to be around £7m). We really do have ‘traction’ now with the people and organisations that matter; those who we hope can help turn our aims into reality. Looking forward into 2017; in January Mott MacDonald, the specialist company employed by ourselves, MCC and Welsh Government, will commence the third stage of the GRIP process, ‘Option Selection’. The first phase of this stage is to produce the Initial Economic Appraisal (including a ‘demand forecast’) and then, if favourable, to move on to phases 2 and 3 of GRIP 3 study, the detailed ‘Option Selection Report’ and finally ‘Approval in Principle’ (including the Strategic Outline Business Case). If all parts of this study, which we hope to complete by Autumn 2017, stand up in terms of technical and economic viability then it is down to finances, priorities and ‘political will’ to start GRIP 4 (Single Option Development – which is the precursor to ‘detailed design’). So, much done and still much to do but we couldn’t do it without the continued support from you, all our followers both local and those further afield. Thank you for that support and may we take this opportunity to wish you all a Happy New Year!